Which Asian country entered a constitutional crisis on October 26 after the president replaced the prime minister? China recently took delivery of two Russian weapons systems that resulted in the United States enacting sanctions on the People’s Liberation Army’s Equipment Development Department (EDD). What were the two systems? Which two countries recently conducted a joint patrol in the Indian Ocean? Which country did Indian Prime Minister Narendra Modi travel to on October 28? What kind of ballistic missile interceptor did the United States successfully test against a live target in October 2018? What is notable about the Hong Kong-Zhuhai-Macau Bridge, which was inaugurated in late-October? Where is the film Crazy Rich Asians set? 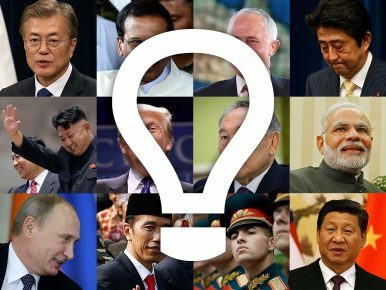 Which of the following leaders has Japanese Prime Minister Shinzo Abe not met this year?